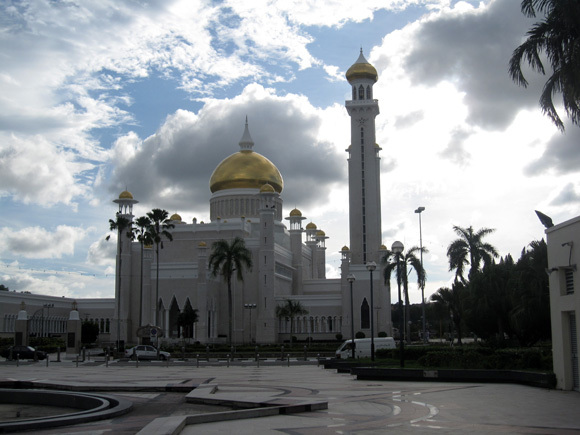 Brunei is a tiny nation surrounded by Malaysia and Indonesia, a small portion of the giant SE Asian island of Borneo. This off-the-travel-radar nation is famous for its Sultan and head of state, General Haji Sir Hassanal Bolkiah Mu'izzaddin Waddaulah. Although anyone would consider the entire island of Borneo to be rich with natural resources and abounding with fresh fruits of this earth, Brunei received an even more world-wide valuable practical resource: crude oil and natural gas. It was just a number of days after attempting to climb Mount Kinabalu, in the Malaysian state of Sabah (on the Malaysian side of Borneo), that I decided to take the ferry to Brunei. I was eager to observe a country that had been blessed with oil, and for once the proceeds of the resource had been used to build the country and transform it into a wealthy economic nation. I was surprised as soon as I exited the ferry, expecting a normal SE Asian greeting with loads of people and touts hustling to sell a ride in their cab, but hearing none of that. Instead there were a few taxi drivers waiting around, none were pushy at attempting to persuade anyone, just calmly waiting around for someone to ask them. 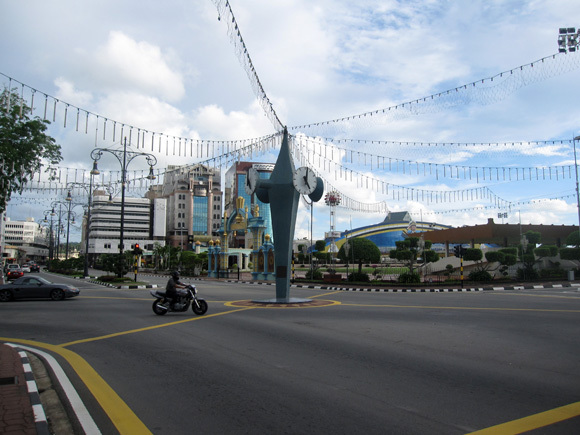 I choose to wait for the bus to get to the center of Bandar Seri Begawan. The drive passed through normal Bruneian homes, everything I observed seemed to be in an economic level a number of steps above the surrounding SE Asian countries. Homes looked like they were Gardens of Eden, surrounded by neatly manicured tropical trees all blooming with fresh fruit. The town was an interesting combination of people, the majority population of ethnic Malays, Indians, and Chinese. 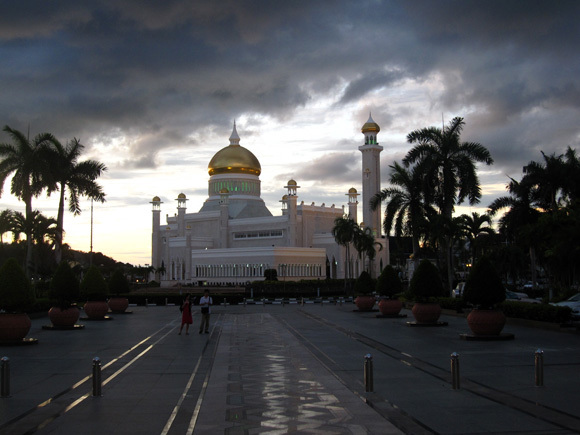 Though Bandar Seri Begawan is the capital and largest city of Brunei, it had such a unique feeling – possibly the quietest and most peaceful capital in Asia. The city was quite the opposite of characteristic Asian cities, lacking all roaring traffic, masses of humanity, and clouds of pollution. Instead it was marked by pleasant greenery and quiet neighborhoods. Drivers even halted out of nowhere to let humans cross the street (something considered sacrilegious in most of the world). During the daylight sun, the gold blindingly shimmered, but as the sun began to set, the dome reflected a wondrous display of color and set an Aladdin-like mood. The awe-inspiring sunset scene would have been a prime atmosphere for gently floating through the air on a Persian carpet! For $20 Bruneian Dollars (1 Brunei Dollar = $0.80 USD) we hired a boat for a tour of Kampong Ayer, a stilted water village that almost 40,000 Bruneians call home. 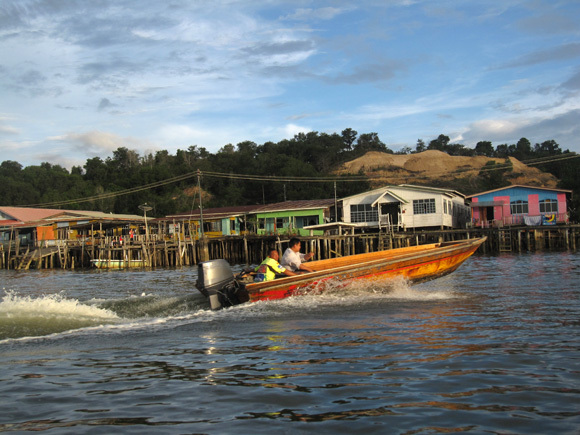 Many of the stilted homes above water were equipped with electricity, satellite dishes, internet, and our skipper even mentioned that many dwellers owned cars parked on land. We sped through the neighborhood, viewing water schools, police stations, a fire station, medical clinics, and even an above water Shell petrol station! 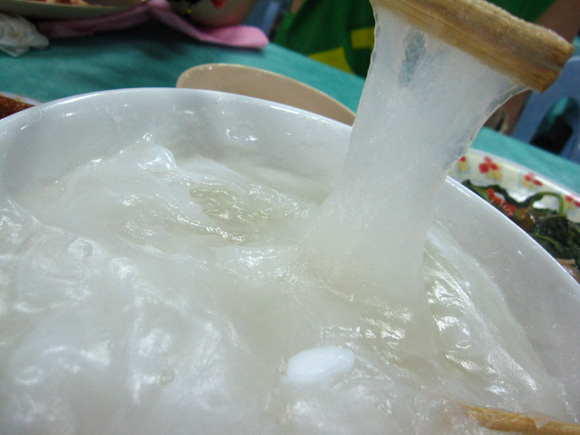 A highlight of my visit to Brunei was the opportunity to eat a dish called Ambuyat, a traditional Bruneian staple made from sago palm starch. The sticky substance is wrapped around a stick and apparently one is supposed to eat it without chewing (learned this afterward). Though I only spent a single day in Bandar Seri Begawan, the calm atmosphere, the friendly people, the unique feeling and serenity made my stay truly unforgettable! 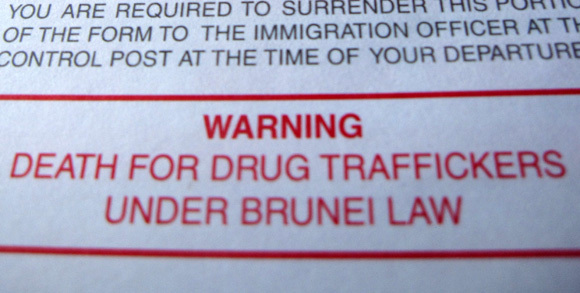 Brunei sounds like an interesting country to visit. Maybe I’ll get there on my next trip to S E Asia. Hi! Thank you for the article, will be going to Brunei this February and I have no idea what to do there considering I only have 1,5 day. I hope it’ll be enough to explore all the interesting places. I have a question about the public transportation, is it easy to go from one place to another by bus? should we wait quite long for it to arrive? HI! As I’m residing in Brunei, frankly speaking the public transport will takes awhile to arrive. If you are on time with the bus arriving time, then you can take the bus. If you miss it, I would recommend you to take the taxis instead of waiting for the next bus.